For three nights in a row after finishing Chimamanda Ngozi Adichie’s Americanah I found myself missing Ifemelu and Obinze. It was about 11 at night, and I was sitting in bed with the vastness of the Oakland sky outside my window. 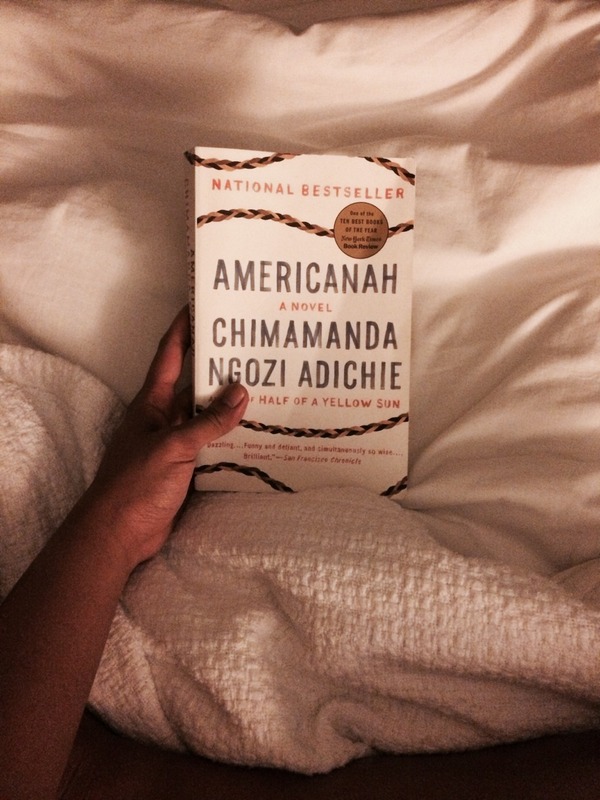 I reached to my side table and held Adichie’s book, still in awe of how one book could contain multiple worlds. How one book could illustrate timelines and lifetimes. I saw myself in the pages, along with Ifemelu and Obinze, the two main characters of Americanah. Ifemelu, with her “prickliness.” Obinze, with his tenderness. Reading about their lives unraveled a reality that was a little bit familiar, albeit entirely different. As I turned each page, I knew that I resonated with the book so much because of two things: immigration and the (im)possibilities of long-distance love. When Ifem (a nickname from Obinze) moved to the U.S., her experience as a non-American Black woman was amplified. It was new to her, much as being a Filipino was new to me. When one lives in a place where you’re part of the majority, identity is never an issue. She wrote about her experiences in a blog called “Raceteenth,” which spurred her popularity in blogging and writing circles. I am so enamored of this book even more, because it also helped me visualize Ifem’s writing process, something that I try to do with this blog. I cried out “me too!” several times every time Ifem pointed out a cultural nuance that resembled a lot of my experiences back in 2004, as a newly immigrated Pinay. Like being told that you speak “good English,” blurring your t’s, the intentionality and consciousness of maintaining an American accent, what to wear to parties (y’all wearing slouched jeans? ), what constitutes a party, the absence of a bath sponge for Ifem (the absence of tabo for me) and other quirks that could be baffling at times. …she was at war with the world, and woke up feeling bruised, imaging a horde of faceless people who were all against her. It terrified her, to be unable to visualize tomorrow. While Ifem dealt with the pain of migration (in addition to microagressions), Obinze’s migration to Europe was wrought with institutional complexities. He became undocumented. While he led a comfortable lifestyle back in Nigeria, Obinze resorted to manual labor and paid much of what he made to find a wife who could grant him a legal status. Nevertheless, his resolve to obtain a national identification number (Europe’s equivalent to a social security card) was relentless, until his sudden move back to Nigeria. He thought about Ifem a lot, even after he stopped hearing from her. In spite of his struggles, there was always something about obinze that spoke to me. When they first started seeing each other in their teens, Ifem spoke of self-affection, something she felt when she was with Obinze. He made her like herself. This was the first time I fell in love with both of them, and the first time that I was reminded of a former lover. When Ifem first moved to NYC, Obinze’s mom told them to make sure that they had a plan. In a way, she reminded me of my ex’s mom, who was always so kind and loving to me as if I was her own daughter and who gave me so much advice when my heart was breaking. I’ve been told over and over again that long-distance relationships never work out, no matter how much unbridled optimism and boundless hope one has. Both times I’ve been in these relationships, I knew that I tried and worked and loved really hard. In spite of intentions and at times one’s unfailing will, geography still plays a huge part. I could go on and on with this book, and how it changed but also reaffirmed me. I found so much solace in each page, as if I was reading my own story although my identity is entirely different. Similar conditions, different realities. Perhaps it is the unities of coming from colonized nations, perhaps it is loving from afar. Whatever it is, we go on, we move on. As I drifted off to sleep that night, I thought of Ifem laying on her bed thinking the same exact thoughts: How easy it was to lie to strangers, to create with strangers the versions of our lives we imagined. This post was originally published on my personal blog in 2014.